Here are some facts about Fixed Odds Betting Terminals. For bookmakers they “are one of the most profitable forms of high street gambling” (see paragraph 1.190 here). In September 2014 there were 35,059 such machines (see Table 2) generating an average revenue per machine (amounts staked minus prizes) of £46,315 (see Tables 2 and 3). They are known to be used by drug dealers to launder money, an issue that Government recognises. A 2005 report by Europe Economics for the Association of British Bookmakers showed that a bookmakers’ gross margin on FOBTs was 2-3% (see paragraph 1.2.4 here), a figure consistent with March 2012 data published by the Guardian (showing a return of 97%). Taken together with the average revenue per machine, this implies an average of over £1.5m per annum is wagered on each machine. Of course, criminals have to pay people to feed this money through machines but they still look (to this uneducated eye) a cheap way to launder money. The statutory regulator, the Gambling Commission, has recognised that, of those who use machines in bookmakers, 50% show characteristics which might indicate that they might be a group at risk of harm (paragraph 9.11 here). And machine gambling in bookmakers and problem gambling in bookmakers are correlated with low income (see paragraph 9.9 and 9.15 here). (both of these charts from this report by the Responsible Gambling Trust which works closely with the Gambling Commission). And that substantially all revenue generated by FOBTs is generated in bookmakers (£1.613bn of £1.623bn see Tables 3 and 8 here). Government benefits too, and through it so do we. Gambling duty applies at a rate of 25% to that revenue (totalling in September 2014, £1.623bn – see Table 3 here) to generate a yield of some £400m. And that leaves net revenue for bookmakers (after machine games duty) of a little over £1.2bn. Bookmakers gain £1.2bn. Government gains £400m. Those revenues come (in unknown part) from money launderers. They also come from gamblers, 50% of whom show characteristics which might indicate they are at risk of harm. And the poor are disproportionately represented amongst those gamblers, a factor that bookmakers take into account in siting their shops. 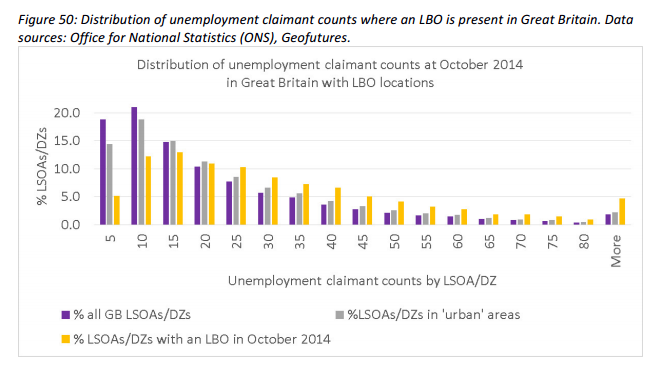 I should also recognise that bookmakers say that these gambling winnings support employment and so deliver employment taxes. All Government is about making choices. We make these choices when we decide how hard to clamp down on the money laundering which primes the UK property market bearing in mind that the structures favoured by money launderers deliver unexpectedly high revenues to Government. We make these choices when the College of Policing decides that an answer to the question how “to deliver policing in an age of austerity” is to accept revenues from the Saudis. We make these choices when we decides how aggressively we want to pursue the low rates of corporation tax that have been described by one academic (reasonably, in my view) as an attempt “to become a tax haven” – but which are expected (reasonably, in my view) to deliver increases in the size of the UK tax base. I don’t want to stand on a high horse and pretend these choices are easy. But an equation that delivers modest (in exchequer terms) amounts of revenue to the Government, substantial amounts to bookmakers, where that revenue is drawn disproportionately from the pockets of the poor and the unemployed, and which facilitates money laundering, doesn’t look like a good choice to me. So the concept of freedom of choice doesn’t enter into your worldview? I accept what you say about money laundering, but are large fortunes really being laundered in this way? Even if so, its a secondary problem – the first is that criminal money is being made which requires laundering, and that should be addressed at source. Like most moral panics, I suspect it is vastly overstated. Smoking is much more damaging, of course, but brings in vast amounts of tax. Is that the extent of your moral compass – the tax take? I don’t gamble – never seen the attraction. I also don’t go to the opera, or do many things that others seem to choose to do. The difference is, I don’t want them banned just because I don’t like them. All that gambling indicates to me is that some people have been through the school system without obtaining a working knowledge of statistics. The government, I agree, has difficult choices. But it should not be spending time & money banning things which people choose to do and which harm no-one but themselves. This includes gambling, smoking, alcohol, voluntary prostitution and drug-taking. MPs are not in loco parentis (thank goodness), and shouldn’t behave like they are. 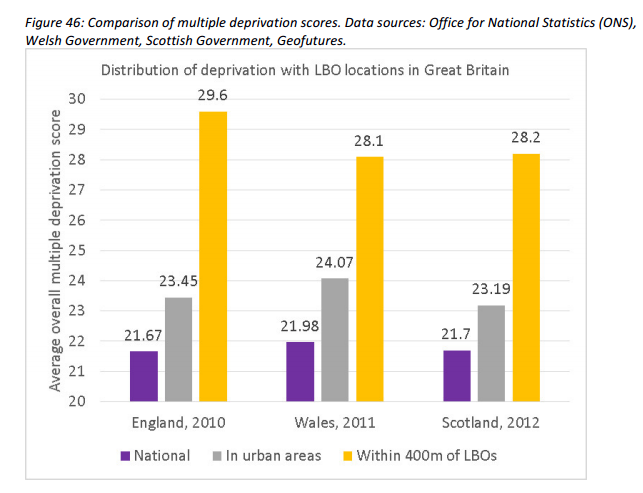 The graph on the deprivation index within 400metres of a LBO needs controlling for other business types, Post Offices, Greggs and tattoo studios for example to clinch the case that the least well off are being targeted or not. Your point on money laundering really supports a case for a law change to permit drug-taking and selling on licenced premises. It still leaves the question as to what intervention if any is needed to discriminate between those not addicted losing 3% of turnover on a pastime, and those who are addicted. I hate banning things, but love the information age.. Perhaps more information should be made available such as after every 5 minute of play, the screen freezes for 30 seconds and tells you your P&L for the session to date, info about what that money could buy you, and perhaps a short story of a problem gambler appears, then you press to resume playing.